This is the message that greets the reader on Bob Woolmer’s official website. 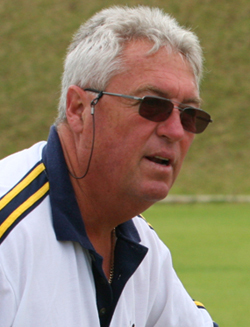 Bob Woolmer the current coach of Pakistan and the laptop weilding coach of South Africa passed away on the weekend. It leaves the cricket world in shock at the end of the first week of the World Cup. It didn’t help matters that this was also the time that his team was unceremoniously kicked out of the World Cup. Born as Robert Andrew Woolmer in Kanpur, he grew up to play for England, bnut rose to fame as a coach. He was instrumental in bringing computing prowess and analysis to coaching and ushered in the digital age into cricket training. The world of cricket is a poorer place, at the loss of this great coach. RIP.